Multi-Media Video : AVI, MP4, FLV, 3GP, MKV, WMV etc. Audio : MP3, WMA, OGG, AAC, WAV FLAC etc. E-Book : PDF, TXT etc. High performance Allwinner A33, CPU 1.5GHz, Quad-core, excellent processing platform. This tablet A33 is superior to A13 and A23, because A13 is single core and A23 is dual core, while Allwinner A33 is quad core, which means fastest running speed. 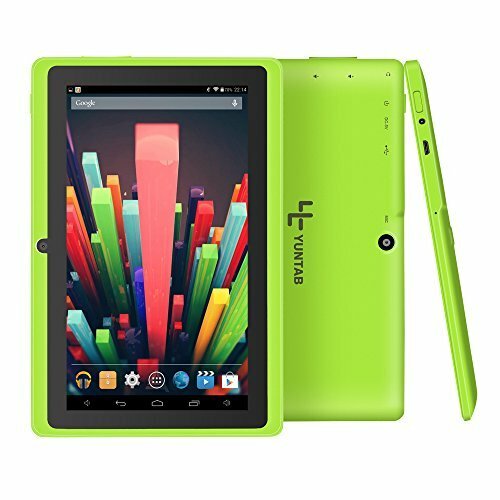 7 inch Tablet PC Android 4.4 operating system, Display Resolution 800*480, 5 Point Capacitive Screen, Dual Camera: Front 0.3MP+ Rear 0.3MP. 512MB DDR3 RAM, 8GB Nand Flash, support external TF Card(Micro SD Card) up to 32GB. The extended storage let u feel free to download and install more APPs you want, which makes your spare time more convenient and colorful. Support 802.11 b/g/n Wi-Fi, Google Play, External 3G ,3D-Game, Blio E-Book Store, Office suite, etc. Package included: 1 * 7 inch tablet pc, 1* English User Manual, 1* USB Cable, 1*Charger.